Mausitxa hamlet is located in the hillside of Urnobitza, where there are the sheeps and where it is made the Mausitxa cheese, with Idiazabal certificate of origin. Thanks to a flock of sheep of 900 sheeps, we obtain the two fundamental elements to make a good quality cheese, the milk and the natural curdling agent. 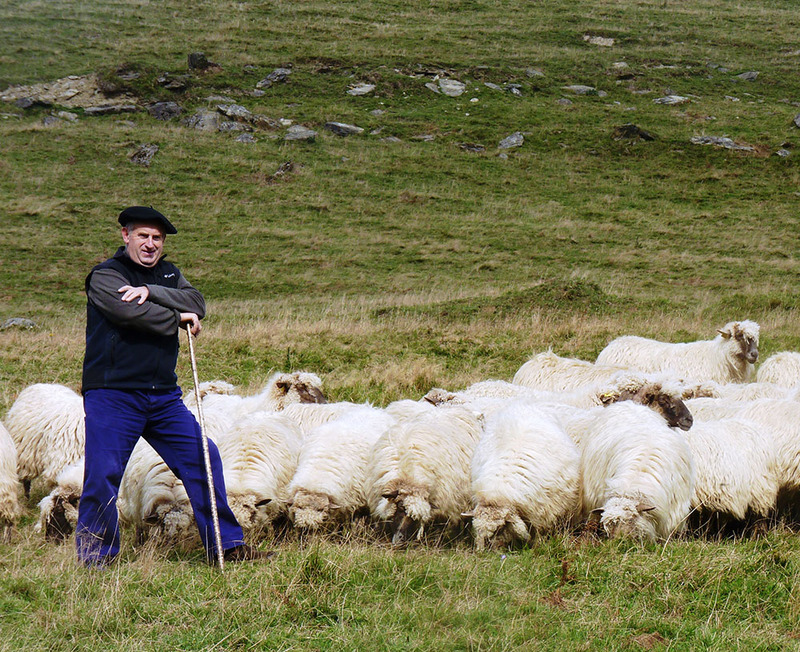 Ansola family has been working from generation to generation on shepherding in the surroundings of Elgoibar. It has been tradition until 1983, when Jesús Ansola and Mª Rosa Salegi decided to work as shepherds and they renovated the cheese factory. Continuing that road, they commercialised their product (excellent, but limited product). The activity of the cheese factory became handmade work and essential for the hamlet. Nowadays Mausitxa hamlet is a privileged place, from where we can have a fantastic panoramic view of the mountains, from Krate and Kamau, from the valley of Deba, to Anboto and Gorbea. We can also see the Cantabrian coast of Deba. In that panoramic we can descry the horizon, which is formed by green fields and woods. The misuse of Mausitxa hamlet is in charge of five people: Jesús Ansola, Mª Rosa Salegi, Iñaki Ansola, Itxaso Irazabal eta Garbiñe Martinez. They take care of nine hundred sheeps and they do many cheeses a day. Iñaki, the soon, wakes up at half past eight and the first thing he does is milking the sheeps. “Everyday we have to milk them twice: 450 sheeps in the morning and 450 in the afternoon”. This task is made by two people, while a third one feeds the animals. “There is always something to do”, says Iñaki. At midday the animals are ready and the mum and Iñaki usually start making the cheese with the milk obtained. The cheese production lasts at five o’clock in the afternoon. Afterwards, they move the sheeps to the barn to feed them. “In that moment the family has dinner and, after dinner, at nine o’clock, we milk the sheeps for the second time”, tells Iñaki. Finally, the cheese goes on sale. They commercialise it theirself, because “is necessary to avoid all the posible intermediaries” to live from this sector.